On Halloween, Bulls fans had a huge scare. Derrick Rose got up on to his feet and immediately started limping, a scene just a little too reminiscent of his previous knee injuries. You could audibly hear fans yelling “NO!” through the TV. Thankfully, Rose only rolled an ankle. But what those fans reactions showed us was exactly how much pressure is on the one-time MVP this year to come back as a productive and healthy player. The desperate yells from all around in the crowd prove that Rose’s return means more to Chicago than just the possibility of a NBA title. Complain all you want about celebrity worship and how much money athletes make; they fill one of the most important roles in our society in our culture. As ridiculous as it sounds, athletes are the closest thing we have to superheroes. Maybe they don’t leap over buildings and stop plane crashes, but no celebrities can lift our spirit the way superstar athletes can, and sometimes they even change the world. Years after Hurricane Katrina, the soul of New Orleans was revived by the Saints Super Bowl win. Jessie Owens and Jackie Robinson made statements about racial inequality with their abilities. The “Miracle on Ice” U.S. Hockey team of 1980 showed an entire country what heart and teamwork can do with one of the greatest underdog stories ever. Those are specific incidents, but athletes are filling the roles of heroes all the time. Just about any bad day can be saved by a big win from our favorite sports teams. Our athletes inspire us, leave us in awe, and lift entire fan bases off of their feet. The relationship between fan and athlete is something that can’t be replicated anywhere else; something that is as powerful as it is impossible to understand. This is why Derrick Rose has to come back. Rose’s arrival to the Bulls was a miracle in itself; they had just a 1 in 100 chance of getting the first pick of the 2008 NBA draft. They used that pick on the Chicago native from Memphis University, who had already proven himself a winner when he was in a college. From the very beginning, Rose’s passion matched his freak athleticism. He outworked his teammates and gave every ounce of energy to each game he played. As he worked on his jump shot and other skills, the Bulls begin putting together pieces around him, already designating the young phenom as their leader for years to come. After the addition of a more suitable coach in Tom Thibodeau, the wins begin piling in. Rose’s improved leadership skills as well as polished basketball game led the Bulls to the best record in the Eastern Conference during 2010-2011 season, leading to his coronation as the MVP of the same season. The city of Chicago begin to sense great things for their Bulls for the first time since Jordan left, this time following a humble and gentle-natured superstar impossible not to love. The next year was plagued with injuries for Rose, but although he was only able to play 39 games, the Bulls once again finished at the top of the Eastern Conference. They would take the one seed in the playoffs, prepared to start off their run against a scrappy 76ers team. That was the day Chicago went silent. In the final two minutes of the game, (Thibodeau would be criticized for playing his stars during garbage minutes) Rose fell to the floor holding his knee and grimacing in pain. The scene itself: their collapsed star, Marv Albert’s call “holding his knee and down…” would go on to send a devastating chill through Bulls fans spines. The Bulls went on to lose to the 76ers, the life and hope completely sucked out of the rest of the team, who had done well enough without him to win most of their games during the regular season. Since then his NBA career has been filled with even more setbacks, including a torn meniscus in the first weeks of his first attempt at a return. He’s been criticized for not playing after the doctor’s cleared him, and for once Derrick Rose got to see people question his heart. With all the effort they saw from him on the court, how could they suddenly believe he didn’t care? But he put it all beside him and focused on the goal at hand, and that has been trying to come back as not just the same player, but better. Rose has put everything into this recovery, striving to get back in form physically and, in turn, psychologically. Now his chance has come. The roster around him is as promising as ever, with rising young players Jimmy Butler and Taj Gibson as well as the improved defensive anchor in the paint, Joakim Noah. A healthy Derrick Rose could mean a Larry O’ Brien trophy for the team. The people rooting hardest for him live in a city that has been in the news constantly for all of the wrong things. Crime in Chicago has reached such a high level that it has garnered nationwide attention, and several local neighborhoods are sporting poverty rates around 60%. Rose was born in one of the poorest areas of Chicago, but through relentless work he was able to prevail and become one of the most successful basketball players in the world. Since coming into the league, he’s been handed every bad break possible (the emergence of the big three in Miami that contained the Bulls in the East, the constant injuries) but still works his hardest to overcome them. Some people look at Derrick Rose now and see a broken down athlete who they simply believe should give up. Others look at Derrick Rose and see an opportunity, a sports story incredible enough to give those in poverty something to believe in, and something to hope for. 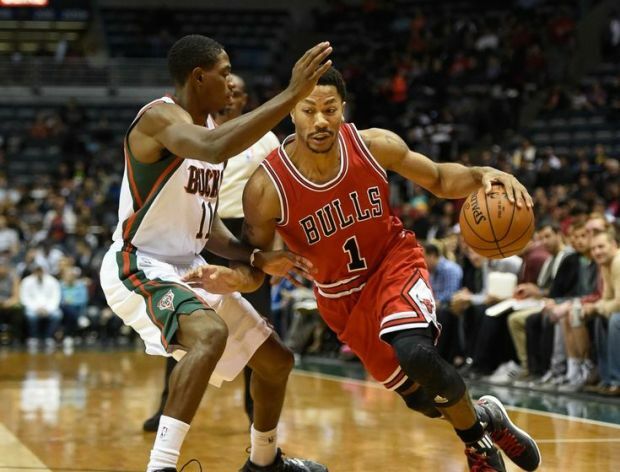 A couple of years ago, analysts were commenting on how Rose was having to carry too much of the load for the Bulls. They questioned whether one player could handle the pressure of being the only star on a team in an era of super teams. Now he has to pick up an entire city.